Gadgets have a way of getting smaller, sleeker and further away from shapes found in nature with every passing generation. It’s easy to get caught up in those ultra-sleek electronics, but some of us miss the organic shapes we used to see outdoors. 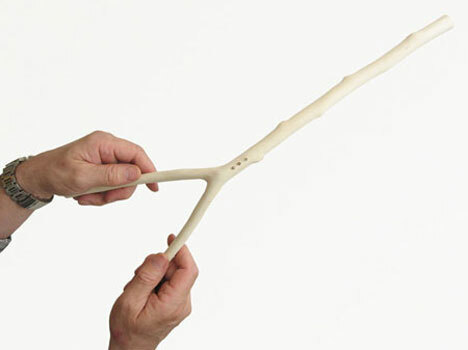 Mike Thompson’s wi-fi dowsing rod combines a graceful natural shape with a high-tech function. 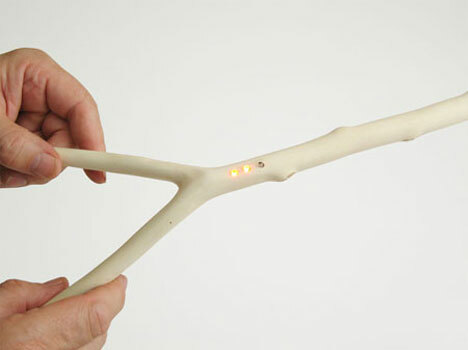 As the name implies, the gadget helps users find a wi-fi signal by leading them in the right direction. Three lights are the only adornment: when there is no wi-fi signal detected all of the lights are dark. As the holder gets closer to the signal, the first and second lights flip on. And when there’s a strong signal, the final green light glows. The lights help guide the dowsing rod’s user to the wi-fi signal by letting him know when he’s moving toward and away from the source. It’s like wardriving, but without any complex gadgets or software needed. The dowsing rod might be something of a tongue-in-cheek concept, but it’s an effective commentary on the disparity between old and new technology: the old technology might still work, but it’s pretty likely you’ll look rather foolish using it. See more in Unbuilt Concepts or under Technology. August, 2010.